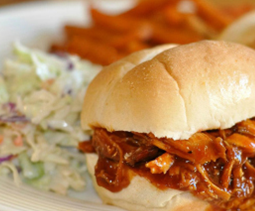 SLOW COOKER/CROCKPOT HONEY BARBEQUE CHICKEN SANDWICHES | Cook, Party, Enjoy! Tonight we’re having barbequed chicken sandwiches. Made in my slow cooker/crock pot it’s that “set it and forget it” concept. You can use thawed or frozen chicken breasts so if you forget to thaw your meat it’s OK. I say this because I always forget to defrost as you will find out about me. I’ll throw this in the slow cooker/crock pot in the morning when I’m getting Zach ready for school and then shred it at around 4:30 when Zach gets home, throw in the barbeque sauce and let it simmer until dinner. Yummy! Perfect every time. In the morning, place chicken in a slow cooker. Sprinkle with the Montreal Chicken Seasoning by McCormick (I love this stuff on chicken or pork and it’s not real expensive) Top with the chopped onion. Pour the Italian seasoning over the chicken. Cover with the lid. Cook 6-8 hours on low or 3-4 hours on high. Prepare the BBQ sauce in a bowl; combine the BBQ sauce, brown sugar and Worcestershire sauce cover and refrigerate for later. When Chicken is done, remove chicken from the slow cooker/crock pot and shred using two forks. Return the chicken to the slow cooker and pour the BBQ sauce mixture over the chicken and stir to coat with sauce; let it cook 30 minutes to an hour more and then serve it up on Big fresh Kaiser rolls. Pushed for time serve it with tossed salad, some potato chips or potato salad and sweet or dill pickle spears; or you can add some cole slaw and potato wedges and you have an amazing meal. Cut cabbage in half and then slice into thin strips. Wash in salad spinner and spin dry. Set Aside. If you prefer you can chop the cabbage into small pieces or run it through the Salad Shooter. In a large bowl, make the dressing. Combine all the ingredients except the cabbage. Mix well. Toss in the cabbage and make sure the dressing coats all the cabbage. Pour into a covered bowl. 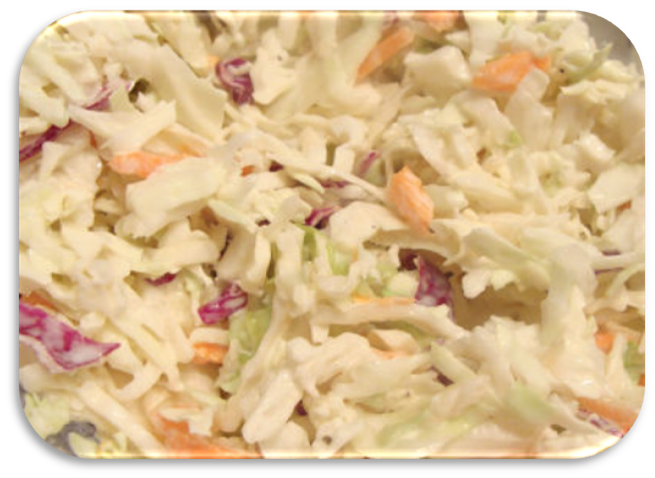 Refrigerate the coleslaw at least 2 hours before serving. TIP: If using pre-shredded store bought cabbage be sure to wash and spin it before using. Even though these products say they are pre-washed it is a good idea to do it yourself. A salad spinner is worth its weight in gold for this. Wash and dry in one simple operation. Pre-heat oven to 425°. Make sure oven is hot before you put in the potatoes. In very large bowl, combine butter, onion, parsley, thyme, salt and pepper. 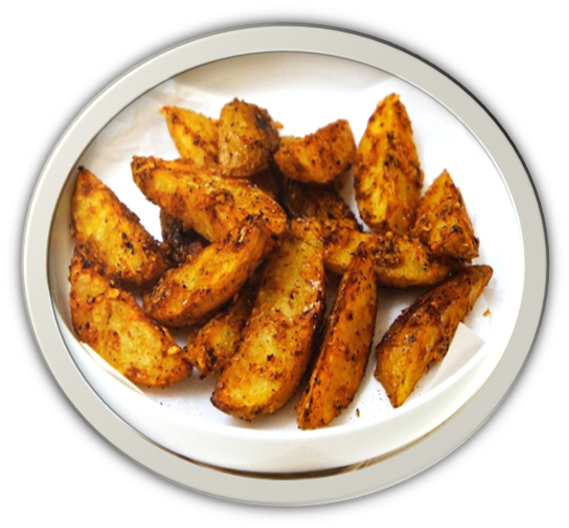 Pour in the potato wedges and spoon around until they are well coated. Layer potatoes on a lightly greased 13 x 9 x 2 inch baking pan. I use my stoneware bar pan to achieve that perfect crispiness. Bake in hot 425° oven for 40-45 minutes until potatoes are crispy on the outside yet still tender on the inside. I find it necessary to turn them over half way through for even baking. For Cheesy Potato Wedges, sprinkle with cheese and bacon and bake an additional 5 minutes until cheese is melted. Use this on potatoes for baking too. Just rub skin of potatoes to be baked with this seasoning oil and bake as usual. My family enjoys this dinner because the barbequed chicken is even delicious later cold on a sandwich w/pickles or just on a plate with some potato salad. I hope you try this next time you want dinner to make itself!